Add this high quality Safavieh Courtyard area rug to your home for an instant splash of style. Designed for your hallway, dining room, or living room, this indoor/outdoor piece made from plush synthetic material looks and feels great. The machine-made construction of this area rug is sure to withstand wear and tear. You and your guests will enjoy the lovely floral plants pattern that decorates this blue rug. This stylish Safavieh Courtyard area rug is a high quality dicor option. Keep it classy, quality, and stylish with this indoor/outdoor rug made from plush synthetic material. Make a lasting style statement with this machine-made rug. Keep things classy, yet high-quality with this geometric patterned blue rug. This Safavieh Courtyard area rug is a great high-quality option for livening up your home. Contemporary dicor is made simple with this indoor/outdoor piece, made of plush synthetic material. Since it is machine-made, you can trust the quality on this rug. This geometric patterned blue rug makes a bold statement in your hallway, dining room, or even living room. Bring this Safavieh Courtyard area rug into your dining room for an easy splash of style. Make your hallway, dining room, or living room more stylish with this indoor/outdoor plush synthetic rug. This rug is machine-made, which ensures a strong product. This contemporary blue rug has a lovely geometric pattern for an impressive look. Courtyard Marc Natural / Blue 6 ft. 7 inch x 6 ft. 7 inch Indoor/Outdoor Round Area Rug Add this high quality Safavieh Courtyard area rug to your home for an instant splash of style. Designed for your hallway, dining room, or living room, this indoor/outdoor piece made from plush synthetic material looks and feels great. The machine-made construction of this area rug is sure to withstand wear and tear. 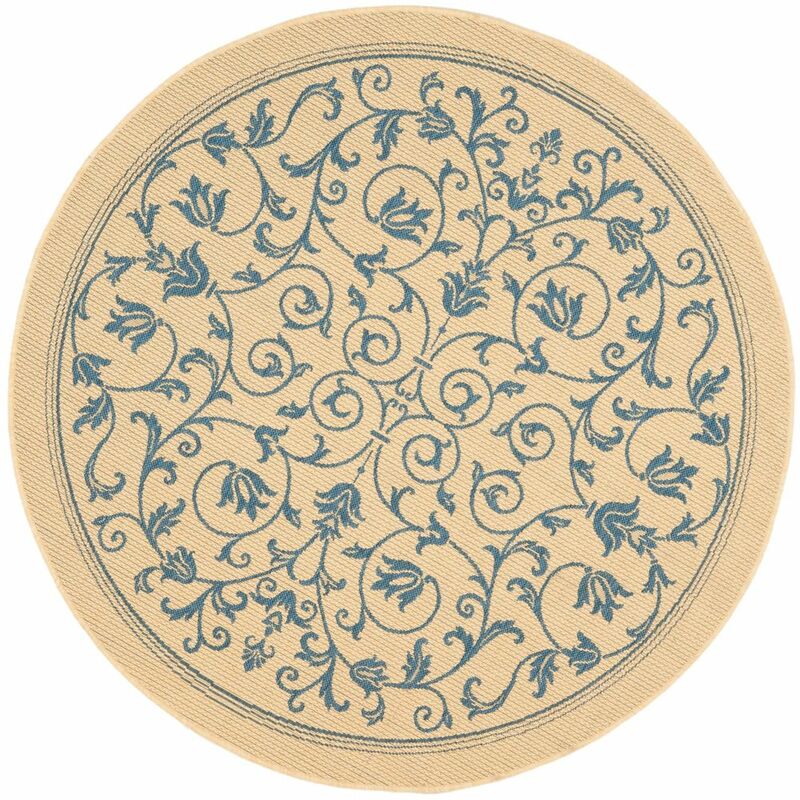 You and your guests will enjoy the lovely floral plants pattern that decorates this blue rug.